I am currently reading a book called Shift Happens by Robert Holden and this paragraph jumped out at me. From – Shift Happens by Robert Holden Ph.D. It really made me stop and think. 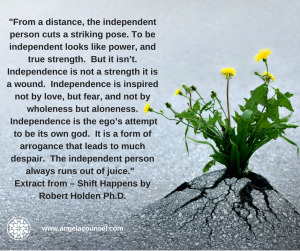 I had always believed that being independent was a good thing and something that we should all strive for. To have someone write that independence was a wound was a bit confronting. I thought I would see what others thought about this. As you can see lots of different thoughts on what independence means to different people. What do I think about independence? I have always considered myself an independent woman, someone who could do most things on my own. But I realise that the independence that I created was often more as a barrier that stopped others from getting too close. Independence meant that I was in control (or so I thought), no one could do it better than me. This was all fear based, it was all about my ego and yes it probably was a wound rather than a strength. On the other hand, over the past few months I have seen my husband lose his independence due to his illness. There were times in hospital that he could not even do the most basic things for himself, it was very hard to watch a once strong and independent man to be so dependent on others. He definitely had to let go of his ego to allow others to help him. As he grows stronger each day he is striving to get some of his independence back, honestly this has been a bit challenging for me because for some reason I want him to be dependent on me for a little while longer (more about that in another blog). What I realise is that independence is not totally bad, but it is not good either. It really depends on why you want to be independent. If it is to maintain some level of control, then this is fear and ego based and can lead to burnout or running out of juice. Being independent so that you can do things for yourself and not be dependent on others to meet your basic needs, this comes from loving yourself and living a full life. Living within an open society or village where everyone is inter-dependent on each other but still able to make independent decisions from a place of love seems to be the ideal that many of us are looking for. 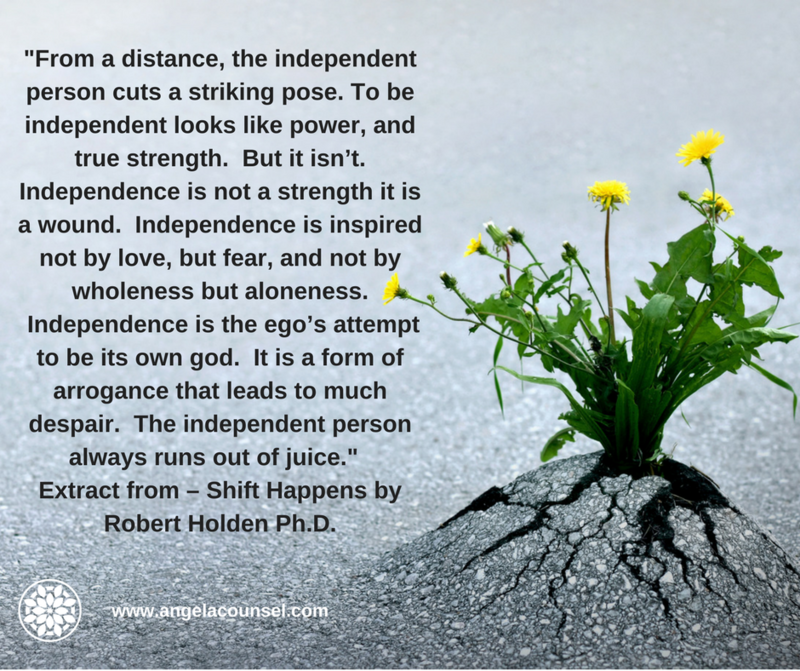 Share in the comments below what you think about independence, is it good or bad? I would love to hear your thoughts. Yes, independence is weakness. Being a lone wolf is exhausting and anyone doing it will defiantly run out of juice (physical, emotional, mental or even spiritually). The independent person will eventually run out of puff and when they do, will fall to their knees and eventually ask for help. In that moment they will realise they cant do life on their own. We are here to love and support each other as well as ourselves. Self is important, yet service is the trump card. If we serve and support the people in our lives and work and we also share ourselves and be human with others (the trials, dramas, joys and highs) they will be there for us and vice versa for our whole life. As for your comment about financial independence…. to make enough money to be financially independent one must create enough value to OTHERS willing to pay for that value. So anyway you look at it… we are bound to humanity and it is bound to us. Being on your own, doing your own thing doesn’t get you very far. Nature and life has a way of sorting that out for people whether they want it or not.